Apple Watch is a line of smartwatches designed, developed, and marketed by Apple Inc. It incorporates fitness tracking and health-oriented capabilities with integration with iOS and other Apple products and services. Apple Watch relies on a wireless connection to an iPhone to perform many of its default functions such as calling and texting. However, Wi-Fi chips in all Apple Watch models allow the smartwatch to have limited connectivity features away from the phone anywhere a Wi-Fi network is available. Series 3 LTE Apple Watches are able to be used without needing to be consistently connected to an iPhone, though an iPhone is still required to set up the device. Most Apple Watches that are currently produced require an iPhone 5s or later with iOS 11; the Series 3 and later LTE models require an iPhone 6 or later with iOS 11 or later. The Apple Watch was released on April 24, 2015 and quickly became the best-selling wearable device with 4.2 million sold in the second quarter of the 2015 fiscal year. 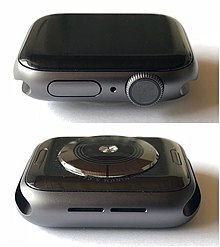 The second generation of Apple Watches were released in two tiers in September 2016: the Apple Watch Series 1 and Apple Watch Series 2, while the first generation was discontinued. The Apple Watch Series 3 was released on September 22, 2017 alongside the discontinuation of the Apple Watch Series 2. The Apple Watch Series 4 was announced on September 12, 2018, with the Apple Watch Series 1 no longer being produced. The goal of the Apple Watch was to enhance the uses of an iPhone while also providing the user with some additional new features. Kevin Lynch was hired by Apple to make wearable technology for the wrist. He said: "People are carrying their phones with them and looking at the screen so much. People want that level of engagement. But how do we provide it in a way that's a little more human, a little more in the moment when you’re with somebody?" Apple's development process was held very much under wraps until a Wired article revealed how some internal design decisions were made. Rumors surrounded an Apple-developed wearable device back as far as 2011, which conceptualized the device as a variation of the iPod that would curve around the user's wrist, and feature Siri integration. On February 10, 2013, both The New York Times and The Wall Street Journal reported that Apple was beginning to develop an iOS-based smartwatch with a curved display. On February 12, 2013, Bloomberg reported that Apple's smartwatch project was "beyond the experimentation phase in its development", and had a team of at least 100 designers working on the project. Further reports in March 2013 indicated that Apple planned to release the device by the end of the year. In July 2013, Financial Times reported that Apple had begun hiring more employees to work on the smartwatch, and that it was targeting a possible retail release in late 2014. In April 2014, Apple CEO Tim Cook told The Wall Street Journal that the company was planning to launch new product categories that year, but did not reveal any specifics. In June 2014, Reuters reported that production was expected to begin in July for a release in October. On September 9, 2014, during a press event where the iPhone 6 was also presented, the new product was introduced by Tim Cook as "the next chapter in Apple's story" with a video that focused on its design and the various combinations of bands and case styles that would be available to the consumers. After the reveal video, the auditorium was filled with prolonged applause and a standing ovation as Tim Cook reappeared onstage wearing an Apple Watch. Cook explained that Apple Watch was "a precise timepiece, a new intimate way to communicate from your wrist, and a comprehensive health and fitness device." In comparison to other Apple products and competing smartwatches, marketing of Apple Watch focused more on advertising the device as a fashion accessory; a 12-page advertising spread for Apple Watch in an issue of Vogue focused primarily on the different combinations of body and band styles available, and downplayed the technological aspects of it. Apple later focused upon its health and fitness-oriented features, competing against dedicated activity trackers, and with watchOS 3, expanded on them with fitness tracking for wheelchair users, social sharing in the Activity app, and a Breathe app to encourage mindfulness. Pre-orders for the Apple Watch began on April 10, 2015, with the official release on April 24. The device was not branded as "iWatch" (which would put it in line with its pre-existing product lines such as iPod, iPhone, and iPad) due to trademark conflicts in certain territories; in the United States, the "iWatch" trademark is owned by OMG Electronics – who was crowdfunding a device under the same name, and is owned in the European Union by Irish firm Probendi. In July 2015, Probendi sued Apple Inc. for trademark infringement, arguing that through keyword advertising on the Google search engine, it caused advertising for the Apple Watch to appear on search results pages when users searched for the trademarked term "iWatch". Initially, the Apple Watch was not available at the Apple Store. Beginning on April 10, 2015, customers could make appointments for demonstrations and fitting, but the device was not in-stock for walk-in purchases and had to be reserved and ordered online. CNET felt that this distribution model was designed to prevent Apple Store locations from having long line-ups due to the high demand. Selected Apple Watch models were available in limited quantities at luxury boutiques and authorized Apple resellers. On June 4, 2015, Apple announced that it did plan to stock Apple Watch models at its retail locations. On August 24, 2015, Best Buy announced that it would begin stocking Apple Watch at its retail stores by the end of September. Both T-Mobile US and Sprint also announced plans to offer Apple Watch through its retail stores. On September 9, 2015, Apple launched a new subset of Apple Watch in collaboration with Hermès. This collection, dubbed "Apple Watch Hermès," comes in a stainless steel body with crafted leather bands in distinctive styles from Hermès. The following year, Apple launched another subset of Apple Watches in collaboration with Nike dubbed "Apple Watch Nike+". Both subsets feature additional watch faces and bands exclusive to their branding, but otherwise function exactly like standard Apple Watches of their series. Apple Watch went on sale in India on November 6, 2015. The device also launched in Chile, the Philippines, Indonesia, and South Africa. The Apple Watch is available in multiple variants, distinguished by different combinations of casing and interchangeable bands. The latest watch is available in two sizes: 40 mm (1.6 in) and 44 mm (1.7 in), replacing the 38 mm (1.5 in) and 42 mm (1.7 in) sizes on previous models. The design of the watch has not changed significantly since its release, so customizable bands and accessories are typically compatible with any Apple Watch of the associating size (38 mm (1.5 in) matches 40 mm (1.6 in) and 42 mm (1.7 in) matches 44 mm (1.7 in)). The casing of the watch includes a mechanism to enable the straps to be interchangeable. For input, the watch includes a "digital crown", which can be turned to scroll or zoom and pressed to return to the home screen, and a touchscreen that features Force Touch technology, which makes it pressure-sensitive and capable of distinguishing between a tap and a press. The watch also has a side button which can be used to display recently used apps and access Apple Pay. Apple rates the device's battery for 18 hours of mixed usage. Apple Watch is charged by means of inductive charging, using a cable similar to the MagSafe cable from Apple's MacBook family of laptops. If the watch's battery depletes to less than 10 percent, the user is alerted and offered to enable a "power reserve" mode, which allows the user to continue to read the time for an additional 72 hours. The watch then reverts to its original mode when recharged. Apple did not explicitly market the first generation Apple Watch as being waterproof, stating that it can withstand splashes of water (such as rain and hand washing), but does not recommend submersion (IPX7). However, external testing by The Iconfactory and others revealed that Apple Watch can function when submerged in various conditions (such as swimming), although its touchscreen experiences "erratic" behavior when submerged. Apple introduced a high level of water resistance with the release of the Apple Watch Series 2, and the device was explicitly advertised as being suitable for swimming and surfing. The second generation has two tiers. The Series 1 has a variant of the Apple S2 processor with GPS removed known as the Apple S1P. It has a lower starting price than first generation watches. The Series 2 has the dual-core Apple S2 processor, water resistance to 50 meters, a display twice as bright, and a GPS receiver. The third generation of the Apple Watch features a faster processor, the dual-core S3, Bluetooth 4.2 vs 4.0 on older models, a built-in altimeter for measuring flights of stairs climbed, increased RAM size, and is available in a variant with LTE cellular connectivity. Siri is able to speak on Apple Watch Series 3 due to the increased processing speed of the Watch. The Series 3 Apple Watch is explicitly not compatible with iPhone 5 devices, requiring users to have an iPhone 5S or later for the GPS-only model, or an iPhone 6 or later for the cellular-enabled model. The fourth generation of the Apple Watch was revealed during the 2018 Apple Special Event held at the Steve Jobs Theater in Cupertino, California. It features larger displays with thinner bezels and rounded corners, a slightly rounder, thinner chassis with a redesigned ceramic back, a new S4 64-bit dual-core processor capable of up to double the S3's performance, new options for watch face customization, and a new electrical heart sensor which works by measuring the potential difference between the wrist and a finger from the opposing hand into the S4 Module over 30 seconds. The ECG system has received clearance from the United States Food and Drug Administration, a first ever for a consumer device, and is supported by the American Heart Association. This device can also detect falls and will automatically contact emergency services unless the user cancels the outgoing call. The microphone was moved to the opposite side between the side button and the digital crown to improve call quality. Other changes include the digital crown incorporating haptic feedback with the Apple Haptic Engine and includes the new Apple-designed W3 wireless chip. Apple Watch runs watchOS, whose interface is based around a home screen with circular app icons. The OS can be navigated using the touchscreen or the crown on the side of the watch. During its debut, the first generation Apple Watch needed to be paired with an iPhone 5 or later running iOS 8.2 or later; this version of iOS introduced the Apple Watch app, which is used to advertise Apple Watch, pairing with an iPhone, customize settings and loaded apps, and highlight compatible apps from the App Store. The Apple Watch is capable of receiving notifications, messages, and phone calls via a paired iPhone. "Glances" allowed users to swipe between pages containing widget-like displays of information; however, this feature was replaced by a new Control Center. watchOS also supports Handoff to send content from Apple Watch to an iOS or macOS device, and act as a viewfinder for an iPhone camera, Siri is also available for voice commands, and is capable of responding with voice prompts on the Series 3 watches. Apple Watch also supports Apple Pay, and enables its use with older iPhone models that do not contain near-field communication (NFC) support. Apple Watch's default apps are designed to interact with their iOS counterparts, such as Mail, Phone, Calendar, Messages, Maps, Music, Photos, Reminders, Remote (which can control iTunes and Apple TV), Stocks, and Wallet. Using the Activity and Workout apps, a user can track their physical activity and send data back to the iPhone for use in its Health app and other HealthKit-enabled software. With watchOS 3, Reminders, Home, Find My Friends, Heart Rate, and Breathe were added to the many stock apps. With the release of watchOS 4 and the Series 3 Apple Watch, iPhone 5 support was dropped, requiring users to use an iPhone 5s or later with iOS 11 or later to use watchOS 4. Apple Watches still running watchOS 3 or below remain compatible with the iPhone 5. Further, watchOS 5 will not support the first Generation (prior to Series 1) Apple Watch. watchOS 1.0.1 featured performance improvements and support for additional emoji and languages, and was released on May 29, 2015. At WWDC 2015, Tim Cook announced watchOS 2.0; described by CNET as a "significant revamp", it included a new software development kit that allows more direct access to the device's hardware, new watch faces, the ability to reply to an e-mail, and other features. watchOS 2.0 was set to be released on September 16, 2015, but was delayed due to a bug fix taking longer than expected; it was instead released on September 21, 2015.
watchOS 2.0 featured new features and more general improvements to Apple Watch. Following the software update, some users experienced issues with lag. watchOS 3.0 was announced at WWDC 2016, with a priority on performance. Users are able to keep apps running in memory as well as receive background updates and refreshed information. Other updates include a new Dock invoked with the side button to replace the performance-laden Glances, an updated Control Center, and new reply options on Messages. Several new watch faces have also been added, including Minnie Mouse, along with the ability to switch watch faces from the lock screen simply by swiping. A new feature called SOS allows users to hold the dock button to make a call to the local emergency line and pull up the user's Medical ID. Another feature is Activity Sharing, which allows sharing of workouts with friends and even sending their heartbeats to one another. A new app called Breathe guides users through breathing exercises throughout the day, with visuals and haptic feedback. watchOS 3.0 was released to developers on June 13, 2016 and was made available to the public on September 13, 2016.
watchOS 3.1 was released to the public on October 24, and watchOS 3.2 was released near the end of March, 2017. Both updates added minor improvements and bug fixes. watchOS 4.0 was announced at WWDC 2017 on June 5, 2017, and released to the public on September 19. watchOS 4 features a proactive Siri watch face, personalized activity coaching, and an entirely redesigned music app. It also introduces GymKit, a technology platform to connect workouts with cardio equipment. watchOS 4.3 was released on 29 March 2018. It introduced support for Nightstand mode in portrait orientation. It brought back the ability for music playing on the iPhone to be controlled using the Music app on the Apple Watch and also enabled control of playback and volume on Apple's HomePod. Other new features included a new charging animation and a new app loading animation. Activity data was added to the Siri watch face, and the battery complication more accurately reports battery life. WatchOS 5.0 was first shown to the public at the San Jose WWDC developer conference held by Apple. It introduced an instant watch-to-watch walkie-talkie mode, all-new Podcasts app, raise-wrist-to-speak Siri, customizable Control Center, and the ability to access notification center and control center from apps. Other features included support for WebKit to view web pages, six new watch faces, and new workout running features. It was released to the public on September 17, 2018.
watchOS supports third-party applications; a WatchKit app runs in the background on the iPhone as an application extension while a set of native user interface resources are installed on Apple Watch. [needs update] Thus, watchOS apps must be bundled within their respective iOS app, and are synced to the watch either manually, or automatically upon installation of the phone app. From June 1, 2016, the only new watch apps allowed on the App Store will be those developed with the watchOS 2 (or later) SDK; no third-party languages or SDKs can be used to develop apps. Apple Watch models have been divided into five "collections": Apple Watch (1st gen-present), Apple Watch Sport (1st gen), Apple Watch Nike+ (Series 2-present), Apple Watch Hermès (1st gen-present), and Apple Watch Edition (1st gen-Series 3). They are differentiated by combinations of cases, bands, and exclusive watch faces; Apple Watch comes with either aluminum or stainless steel cases, and various watch bands (only stainless steel was offered for Apple Watch 1st gen); Apple Watch Sport came with aluminum cases and sport bands or woven nylon bands; Apple Watch Nike+ comes with aluminum cases and Nike sport bands or sport loops; Apple Watch Hermès uses stainless steel cases and Hermès leather watch bands (also included is an exclusive Hermès orange sport band); and Apple Watch Edition came with ceramic cases and various bands (the 1st gen Apple Watch Edition used 18 karat yellow or rose gold). Apple Watch Series 1 models were previously only available with aluminum cases and sport bands. Apple Watch Series 3 and Series 4 models are also sold in variants that allows for cellular LTE capability. Each model through Series 3 comes in a 38- or 42-millimeter body, with the larger size having a slightly larger screen and battery. The Series 4 has been updated to 40- and 44-millimeter models, respectively. Each model has various color and band options. Featured Apple-made bands include colored sport bands, sport loop, woven nylon band, classic buckle, modern buckle, leather loop, Milanese loop, and a link bracelet. ^[A] At time of original release. An Apple Store opens its doors on the first day of sales of the Apple Watch. Following the announcement, initial impressions from technology and watch industry observers were varied; the watch was praised by some for its "design, potential capabilities and eventual usefulness", while others offered criticism of these same aspects. Venture capitalist Marc Andreessen said he "can't wait" to try it, and Steve Jobs' biographer Walter Isaacson described it as "extremely cool" and an example of future technology that is "much more embedded into our lives". However, Evan Dashevsky of PC Magazine said it offered nothing new in terms of functionality compared to the Moto 360, except the customizable vibration notifications. In November 2014, Apple Watch was listed by Time as one of the 25 Best Inventions of 2014. Initial reviews for the device have been generally positive with some caveats. Reviewers praised the watch's potential ability to integrate into everyday life and the overall design of the product, but noted issues of speed and price. Many reviewers described the watch as functional and convenient, while also noting failure to offer as much potential functionality as preceding smartphones. Farhad Manjoo of The New York Times mentioned the device's steep learning curve, stating it took him "three long, often confusing and frustrating days" to become accustomed to watchOS 1, but loved it thereafter. Some reviewers also compared it to competing products, such as Android Wear devices, and claimed "The Smartwatch Finally Makes Sense". Reviewers had mixed opinions on battery life though, with Geoffrey Fowler of The Wall Street Journal saying "the battery lives up to its all-day billing, but sometimes just barely," and others compared it to the Samsung Gear 2, which "strolls through three days of moderate usage." Tim Bradshaw of the Financial Times used several applications over a period of days. He concluded that there is no "killer application" so far besides telling the time, which is the basic function of a wristwatch anyhow. When using the Apple Watch, some users have reported issues using the heart monitoring feature due to permanent skin conditions including tattoos. The Watch uses photoplethysmography technology (PPG) which utilizes the green LED lights to measure heart rates. To gauge a user's heart rate, the watch flashes green light from the LEDs at the skin and records the amount of this light that is absorbed by the red pigment of the blood. However, under certain circumstances the skin may not allow for the light absorption to be read properly and thus provide inaccurate results. Some users have complained that the logo and text on the back of the Apple Watch Sport model, primarily the space gray version, can be easily worn off. Financial analysts offered early sales estimates from a few million to as many as 34.7 million in the first year. Time's Tim Bajarin summarized the breadth of reactions, writing that "there is not enough information yet to determine how this product will fare when it finally reaches the market next year". Owing to the inadequacy of materials, the Apple Watch's delivery was delayed from its initial pre-order release date of April 10, 2015. As a result, only 22 percent of the pre-ordered Apple Watches were dispatched in the United States during the weekend after the release date. It is estimated Apple received almost one million Apple Watch pre-orders in the United States during the initial six hours of the pre-order period on April 10, 2015, after which it sold out and further orders would start delivering in June. A report later on by an analyst stated that Apple Watch was already a $10 billion business during its first year. Apple has not disclosed any sales figures for the Apple Watch. An estimate by IDC states Apple shipped over 12 million units in 2015. In late 2016, a veteran of the Swiss watch industry said Apple sold about 20 million watches and had a market share of about 50 percent. ^ Eva Dou (June 20, 2014). "Who Is Apple's Watch Maker?". The Wall Street Journal. Retrieved February 8, 2015. ^ Joe Rossignol (September 26, 2018). "Apple Watch Series 4 Expected to Gain Second Manufacturer Following 'Much Better Than Expected' Demand". MacRumors. Retrieved September 26, 2018. ^ Heisler, Yoni (2017-09-27). "How many Apple Watches has Apple sold so far?". BGR. Retrieved 2018-08-23. ^ "Steve T-S on Twitter". ^ a b c d e "Teardown shows Apple Watch S1 chip has custom CPU, 512MB RAM, 8GB storage". AppleInsider. Retrieved April 30, 2015. ^ a b c d e f g h i j k l m n o p q "Apple Watch Series 3 - Technical Specifications". support.apple.com. ^ a b c "Apple Watch Series 4 - Technical Specifications". support.apple.com. Retrieved 2018-09-17. ^ a b c d e f g h i j k l m n o "Review: The absolutely optional Apple Watch and Watch OS 1.0". Ars Technica. Retrieved July 15, 2015. ^ "Apple Watch runs 'most' of iOS 8.2, may use A5-equivalent processor". AppleInsider. Retrieved April 25, 2015. ^ a b c d e f g h i j k l m n o p "Apple Watch (1st generation) - Technical Specifications". support.apple.com. ^ "Apple Watch Series 2 - Technical Specifications". support.apple.com. Retrieved 2018-09-17. ^ "Apple Watch Teardown - iFixit". Retrieved April 24, 2015. ^ a b Ho, Joshua; Chester, Brandon (July 20, 2015). "The Apple Watch Review". AnandTech. Retrieved July 27, 2015. ^ "Set up and use cellular on Apple Watch Series 3 (GPS + Cellular)". ^ a b "The Verge live blog". The Verge. Vox Media. September 9, 2014. Archived from the original on September 9, 2014. Retrieved September 10, 2014. ^ Etherington, Darrell. "Tim Cook Says Apple Watch Ships In April". TechCrunch. AOL. Retrieved January 28, 2015. ^ "Apple Watch is 'world's best selling wearable' with 4.2 million shifted in Q2". ^ "Apple Watch Price Details in India". ^ Humrick, Matt (September 7, 2016). "Apple announces Apple Watch Series 2". Anandtech. Retrieved September 8, 2016. ^ "Apple Watch 3 vs Apple Watch 2: What's new?". iMore. September 14, 2017. Retrieved October 4, 2018. ^ "Apple silently killed off the Watch Series 2". ^ "Redesigned Apple Watch Series 4 revolutionizes communication, fitness and health". Apple Newsroom. Retrieved 2018-09-12. ^ a b c "iPhone Killer: The Secret History of the Apple Watch". WIRED. ^ "Rumor: Apple working on wearable iPod with Siri control | iMore". iMore. Retrieved September 1, 2015. ^ "Apple is 'experimenting' with curved glass smartwatch, says NYT and WSJ". The Verge. Retrieved July 15, 2015. ^ "Apple Said to Have Team Developing Wristwatch Computer". Bloomberg. Retrieved July 15, 2015. ^ "Apple's Planned 'IWatch' Could Be More Profitable Than TV". Bloomberg. Retrieved July 15, 2015. ^ "Apple on iWatch hiring blitz ahead of possible late 2014 launch, says Financial Times". The Verge. Retrieved July 15, 2015. ^ "Apple's Cook on New Products: 'Take the Time to Get It Right'". Digits. Wall Street Journal. Retrieved July 15, 2015. ^ "Apple Watch announced: available for $349 early next year". The Verge. Retrieved July 15, 2015. ^ "The Apple Watch is poised to dominate the market for digital fitness trackers". The Verge. Retrieved July 15, 2015. ^ "Apple Watch is competing as a fashion accessory, and that's a risky move". Washington Post. Retrieved July 15, 2015. ^ "First Apple Watch ads in U.S. magazines favor fashion lovers over techies". Mashable. Retrieved July 15, 2015. ^ Quinn, Bradley. "Apple Watch isn't about fashion design; it's about the fashion industry". Techradar. Future. Retrieved July 15, 2015. ^ "Apple Watch release date is April 24th, with pricing from $349 to over $10,000". The Verge. Retrieved July 15, 2015. ^ "Non-Apple companies hold iWatch trademark in U.S., U.K., China". CNET. Retrieved July 15, 2015. ^ "Why the Apple Watch isn't called the iWatch". CNBC. NBCUniversal News Group. Retrieved July 15, 2015. ^ "The Apple iWatch doesn't exist, but a legal fight over it does". Ars Technica. Retrieved July 15, 2015. ^ "Apple Watch launch: Plan ahead – it's by appointment only". CNET. Retrieved July 15, 2015. ^ a b "Apple Watch can now be reserved for in-store purchase". CNET. Retrieved July 15, 2015. ^ "Want an Apple Watch on Friday? Head to a luxury boutique". CNET. Retrieved July 15, 2015. ^ "The Apple Watch will be available at all Best Buy locations next month". The Verge. Retrieved September 22, 2015. ^ "Buy Apple Watch From Sprint on Friday". PC Magazine. Retrieved September 22, 2015. ^ Reisinger, Don. "Apple's Pricey Hermès Smartwatch Will Be Available Online Friday". fortune.com. Fortune Magazine. Retrieved January 21, 2016. ^ "Apple & Nike launch Apple Watch Nike+". ^ Diaconescu, Adrian (November 6, 2015). "Apple Watch finally goes on sale in India starting at the equivalent of $470". Pocketnow. Retrieved November 6, 2015. ^ "Apple Watch coming to India on Nov. 6, prices and resellers unknown". Retrieved October 23, 2015. ^ "Tanggal Rilis Apple Watch di Indonesia Terkuak: Akhir November!". Makemac. Retrieved November 14, 2015. ^ "Apple Watch – Buy". Apple.com. Retrieved January 22, 2016. ^ "Apple Watch Series 4 - Technical Specifications". Apple.com. Retrieved February 20, 2019. ^ a b "The Verge: The 15 most important announcements from the Apple Watch, iPhone 6 event". The Verge. Vox Media. September 9, 2014. Retrieved September 10, 2014. ^ "Wearable of the Month: The Apple Watch". Humavox. October 29, 2015. ^ "General Battery Information". Apple Inc. Retrieved April 11, 2015. ^ "A Detailed Look at How the Apple Watch Functions in Water". MacRumors. Retrieved July 15, 2015. ^ "Apple Watch swim app works – but it will void your warranty". Cult of Mac. Retrieved July 15, 2015. ^ a b "Apple Introduces Apple Watch Series 2, The Ultimate Device For A Healthy Life". apple.com. Retrieved September 11, 2016. ^ Apple Watch includes 8 GB of storage, allows 2 GB of music storage and 75 MB of photos. Retrieved March 11, 2015. ^ Stern, Joanna (20 September 2017). "Apple Watch Series 3 Review: Untethered... and Unreliable". Wall Street Journal. Retrieved 22 September 2017. ^ "Apple Watch Series 4: Beautifully redesigned with breakthrough communication, fitness and health capabilities". Apple Newsroom. Retrieved 2018-09-12. ^ "Apple Watch now offers ECG, the first over-the-counter consumer device to do so". 9to5Mac. 2018-09-12. Retrieved 2018-11-18. ^ Goode, Lauren (2018-09-12). "Apple Watch's Update Adds Heart-Monitoring Capabilities". Wired. ISSN 1059-1028. Retrieved 2018-12-12. ^ "watchOS 5 Preview". Apple Inc. Retrieved 2018-06-14. ^ "Apple releases first Apple Watch update with watchOS 1.0.1, adding new Emoji & languages, app improvements, more". 9to5Mac. Retrieved June 10, 2015. ^ "Get ready for Apple Watch 2.0". CNET. Retrieved June 10, 2015. ^ "Apple Previews New Apple Watch Software". Retrieved August 30, 2015. ^ Cunningham, Andrew (September 21, 2015). "After delay, Apple releases watchOS 2.0 to the public". Ars Technica. Condé Nast. Retrieved September 21, 2015. ^ "Why I'm cheating on my Apple Watch". Cult of Mac. Retrieved March 13, 2016. ^ "Apple Releases watchOS 3.1 to the public with bug fixes, update through iPhone Watch app| 9TO5Mac". 9TO5Mac. Retrieved May 27, 2017. ^ "watchOS 5 for Apple Watch now available with Podcasts and Walkie-Talkie apps, much more". 9to5Mac. 2018-09-17. Retrieved 2018-11-18. ^ Cunningham, Andrew (November 18, 2014). "Apple releases WatchKit developer tools alongside first iOS 8.2 beta". Ars Technica. Condé Nast. Retrieved May 15, 2015. ^ "Apple requires all new watchOS apps be native by June 1". AppleInsider. April 22, 2016. Retrieved May 15, 2017. ^ "Apple Watch: 18-Karat Gold Premium Smartwatch Edition To Be Priced At $5000". September 17, 2014. ^ "Buy Apple Watch Series 1". apple.com. Retrieved October 15, 2016. ^ a b c d e f g h i j k l m n o p q r s t u v w x y z aa ab ac ad ae af ag ah ai aj ak al am an ao ap aq ar as at au av aw ax "Apple Watch – Compare". Apple. Retrieved 5 March 2018. ^ "Apple Watch - Compare Models". Apple. Retrieved 2018-09-13. ^ "LTPO backplane technology - introduction and news". OLED-info. Metalgrass Ltd. 10 February 2019. Retrieved 27 February 2019. ^ www.techinsights.com. "Apple Watch Series 3 Teardown". www.techinsights.com. Retrieved 2018-03-05. ^ a b c "watchOS 5 compatibility". ^ "Apple introduces Apple Watch Series 2". ^ "Apple Product Information Sheet" (PDF). Apple Inc. September 18, 2018. ^ "Apple Watch Series 4 Teardown". iFixit. 2018-09-24. Retrieved 2018-09-25. ^ "Apple Watch Environmental Report" (PDF). Apple and the Environment. Apple Inc. September 2015. Archived from the original (PDF) on March 17, 2016. Retrieved March 29, 2016. ^ "Apple Watch Series 1 Environmental Report" (PDF). ^ "Apple Watch Series 2 Environmental Report" (PDF). ^ "Apple Watch Series 3 (GPS) Environmental Report" (PDF). September 2017. Retrieved 24 October 2017. ^ "Apple Watch Series 3 (GPS + Cellular) Environmental Report" (PDF). September 2017. Retrieved 24 October 2017. ^ "Apple Watch Series 4 (GPS) Environmental Report" (PDF). Apple Environmental Status Report. September 12, 2018. ^ "Apple Watch Series 4 (GPS + Cellular) Environmental Report" (PDF). Apple Environmental Status Report. September 12, 2018. ^ a b c Bajarin, Tim (September 29, 2014). "Nobody Can Predict the Success of Apple's Watch Yet". Time. Retrieved April 2, 2015. ^ "Zuckerberg is world's best CEO, Twitter the eighth wonder, says Marc Andreessen". CNET. October 7, 2014. Retrieved October 14, 2014. ^ Shaban, Hamza (October 6, 2014). "Walter Isaacson Talks AI, Apple Watch, and His New Book The Innovators". Gizmodo. Retrieved October 14, 2014. ^ "There's Only One Reason to Buy an Apple Watch". PC Magazine. September 10, 2014. Retrieved September 10, 2014. ^ "The 25 Best Inventions of 2014". Time. November 20, 2014. Retrieved January 21, 2015. ^ Biggs, Tim (April 9, 2015). "Apple watch reviews very positive, with some caveats". Sydney Morning Herald. Retrieved April 9, 2015. ^ Manjoo, Farhad (April 8, 2015). "Apple Watch Review: Bliss, but Only After a Steep Learning Curve". The New York Times. Retrieved April 25, 2015. ^ a b Fowler, Geoffrey (April 8, 2015). "Apple Watch Review: The Smartwatch Finally Makes Sense". The Wall Street Journal. Retrieved April 9, 2015. ^ Johnson, Luke. "Samsung Gear 2: Apps, Battery, Value and Verdict". TrustedReviews. Retrieved April 9, 2015. It strolled through three days moderate usage, which is two full days longer than the Galaxy Gear, but's still short of what we would like to see on a wearable. ^ Cooper, Belle (21 February 2016). "How do fitness trackers measure your heart rate?". ^ Hern, Alex (30 April 2015). "How #tattoogate has highlighted a wider problem with wearables". ^ "Your heart rate. What it means, and where on Apple Watch you'll find it". Apple Inc. May 30, 2015. Retrieved August 19, 2015. ^ Roger Fingas. "Apple Watch Sport owners report unexpected rear logo damage, other text scratching off". ^ "Apple Watch Sport Users Complain That Lettering And Logo Are Wearing Off". Consumerist. Retrieved August 20, 2015. ^ "Apple Watch sales to reach 36 million in first year, analyst predicts". CNET. Retrieved June 7, 2015. ^ Shara Tibkens. "Apple Watch delays may be due to faulty part". CNET. Retrieved August 19, 2015. ^ Lance Whitney. "Apple Watch may have shipped to only 22 percent of preorder buyers so far". CNET. Retrieved August 19, 2015. ^ Dan Frommer. "Apple Watch pre-orders were 1 million in the US on its first day, a shopping data firm estimates". Quartz. Retrieved April 13, 2015. ^ "Apple Watch Is Already a $10 Billion Business". Retrieved July 2, 2016. ^ "Apple Watch Is A Colossal $10 Billion Business After Just 1 Year In The Market". The Cryd's Daily. Retrieved July 2, 2016. ^ "Here's How Much the Apple Watch Business Is Worth". Fortune. July 1, 2016. Retrieved July 2, 2016. ^ Reisinger, Ron. "Apple Watch Sales Have Plummeted, Analyst Says". Fortune. Retrieved January 1, 2017. ^ Nick, Statt. "Apple shipped 11.6 million Apple Watches last year, says IDC (Feb 24, 2016)". TheVerge.com. Retrieved January 1, 2017. ^ "Swiss watch sector set for smartwatch boom". Reuters. January 1, 2017. Retrieved January 1, 2017. Wikimedia Commons has media related to Apple Watch. This page was last edited on 9 April 2019, at 06:45 (UTC).